Last year, a total of three ships made journeys from the the Russian port of Ust-Luga, near St. Petersburg, east along the Northern Sea Route towards Asia. Of the three ships, two were tankers carrying shipments of naphtha, a hydrocarbon, to Yeosu, South Korea. One of these tankers represented the first pilot voyage of the NSR by South Korean company Hyundai Heavy Shipping, which it accomplished with the assistance of Swedish company Stena Bulk. The location in the Far East unmentioned in the article? Rajin, North Korea. Located on the Hermit Kingdom’s northeast coast, it’s the most northerly ice-free port in Asia. 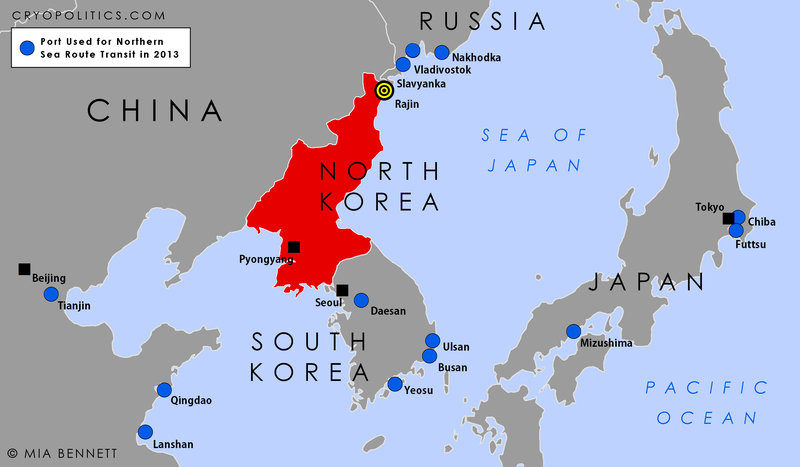 In 1991, after the collapse of the Soviet Union, the North Korean government designated the cities of Rajin and nearby Sonbong as constituent members of the “Rason Special Economic Zone” (SEZ). Not much came of this SEZ until 2011, when China officially began participating in its development. If we infer from the SeaTrade Global news article, the general cargo on board HHL Hong Kong that was delivered to Rajin seems to have consisted of four 56-meter-tall, 400-tonne cranes. These cranes were possibly for use in building out Rajin’s port with Russia’s help. The isolated country has reportedly leased Rajin’s dock Number 3 to Russia, which is investing $66 million in upgrades to the dock and nearby infrastructure including a railway. According to a March 2013 story from South Korean news agency Yonhap, in the past year or so, North Korea has increased its imports of cargo machinery in order to expand the port. A report from the Korea Trade-Investment Promotion Agency explains that Russia exported $21.16 million worth of jib cranes to North Korea last year, accounting for 22 percent of its exports to the country. The value of crane shipments even surpasses Russia’s oil and coal exports to North Korea. The port’s modernization likely involves cranes such as the very ones transported by HHL Hong Kong. Map 1: In red, the voyage taken by HHL Hong Kong from Ust-Luga, Russia to Rajin, North Korea in 2013. The port of Rajin: a “logistics hub” in the making? Why exactly is Russia interested in modernizing Rajin? For starters, the North Korean port could become a “logistics hub” if it is linked into the Trans-Siberian Railway. Already, there is a railway connecting Russia and North Korea via the crossing at the Tumen River (check out this blog for a fascinating account of two passengers’ journey by rail from Vienna to Pyongyang). In 2013, upgrades to the 54-kilometer railway from Khasan, the last town in Russia before the Tumen River crossing, to the port at Rajin were completed, fulfilling a 2008 agreement signed between the North Korean Ministry of Railways and Russian Railways. An impressive photo from AFP shows the ceremony that took place in September to commemorate the upgrades, complete with large cranes in the background. With the upgraded rail link, Russia can transport more containerized cargo through the port, which is envisioned to eventually be able to handle 4 million ton of cargo annually. Still, this is a small amount: Russia’s Ust-Luga port may soon be handling 180 million tons annually, for instance. There are even dreams of eventually modernizing the railway all the way to Busan, the world’s fifth-busiest container port, in South Korea. Infrastructure, however, can’t just be upgraded once to magically function. It needs to be maintained, too, which presents a major challenge to North Korea. While linkages between North Korea and Russia are improving, to really turn Rajin into a logistics hub would likely require massive changes to the political situation on the Korean Peninsula. So far, it seems that the only alterations have been negative. In the wake of the purge and subsequent assassination of North Korean leader Kim Jong-un’s uncle late in 2012, Yonhap reports that the country’s trade ties with China have soured. Beijing is reportedly no longer leasing the other two piers at the port, if it ever was. An earlier Joong Ang Daily article from November 2013 (ironically published around the same time as this Forbes article, which makes it sound as if Rason is open for business) called the Rason special economic zone a “ghost town.” Joong Ang Daily also claimed that construction on the Russian-owned pier had stopped, too. The North Korean Economy Watch blog has more on the confusion surrounding Rason’s current status. 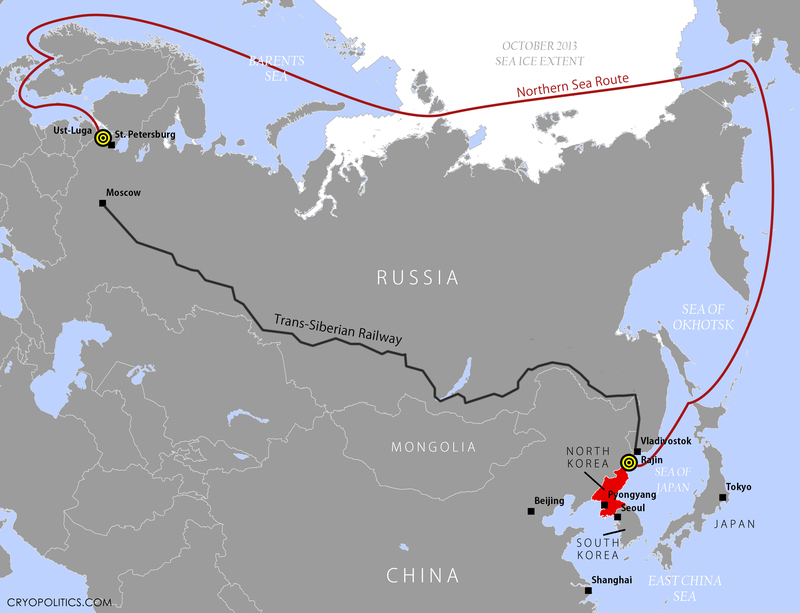 Yet even if works within the special economic zone have temporarily stalled, the improved railway and maritime connections from the Port of Rajin are still notable developments worth considering in relation to the Arctic shipping network. As the map below shows, Rajin falls squarely within the group of ports in Northeast Asia at which ships transiting the NSR either arrived at or departed from in 2013. Three of these ports, Busan, Qingdao, and Tianjin, are some of the world’s top 10 busiest container ports. Map 2: Rajin’s location in relation to other ports in Northeast Asia. The dark horse in the story of Rajin’s erratic modernization is Mongolia. The landlocked country’s president, Tsakhiagiin Elbegdorj, traveled to North Korea for a four-day visit in November, though he did not meet with Kim Jong-un. Blogger Scott LaFoy notes that the Mongolia-North Korea relationship could be aimed at improving energy security. Mongolia has oil but not refineries, while North Korea has refineries but little oil. According to Forbes, Ulaanbaatar-based HBOil, which has a 20% stake in the North Korean state-dominated Korean Oil Exploration Corporation, is interested in investing in an oil refinery on North Korea’s west coast. The Seungri refinery within the Rason zone, which was built with Russian technology, seems a likely candidate, although it is located on the east coast. Should the Rason special economic zone’s port and oil refinery take off, this could amplify North Korea’s ability to benefit from its position at the eastern end of the NSR. The passage has the potential to turn into an Arctic energy corridor. Already, two-thirds of the vessels traveling from Europe to Asia last year on the route were carrying hydrocarbons (NSR Administration). Mongolia and North Korea are two countries on the Arctic’s periphery that could eventually play a role in connecting the Arctic region to the economic powerhouses of East Asia. The two peripheral countries are closer to the Arctic than China, Japan, and South Korea. These three countries are observers in the Arctic Council, but North Korea and Mongolia are not, though the latter has supposedly applied for observer status. As the Wall Street Journal notes, Rajin “has big potential as a port for landlocked east Jilin and Heilongjiang provinces.” With its northernmost latitude at 53°33’N, Heilongjiang is also China’s northernmost province and one sometimes mentioned by Chinese officials to bolster their country’s claims to be a “near-Arctic state.” Access to the port at Rajin would bring northeastern China that much closer to the Arctic via the NSR. Despite the arrival of one lone ship from Russia via the NSR to the flailing port of Rajin last year, North Korea still has a long way to go before it catches up to its neighbor to the south. Five hundred miles down the east coast of the Korean Peninsula lies the Port of Busan, in South Korea, a country well on its way to becoming a fully-fledged polar state. It was here at the Yeongdo shipyard in 2009 that Hanjin Heavy Industries completed construction of one of the world’s most modern icebreakers: South Korea’s RV Araon. Given the intermittent modernization efforts of the Rason special economic zone, North Korea will not become a polar state with capabilities like those of South Korea anytime soon. 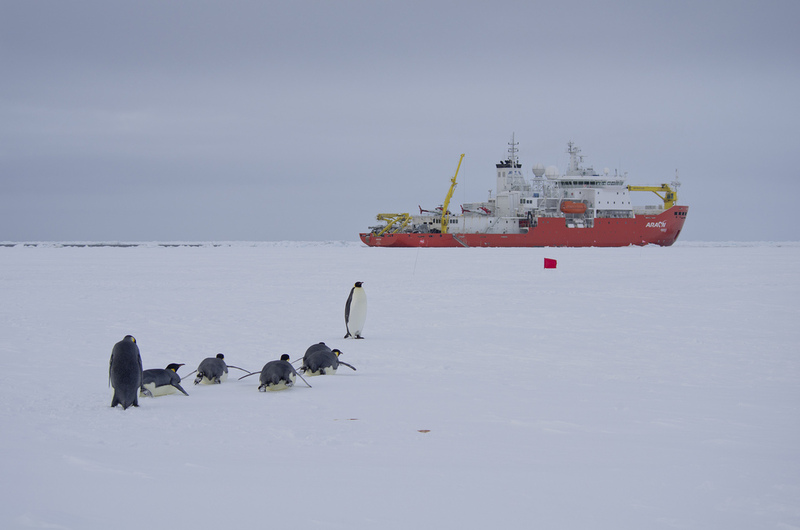 North Korea has a long way to go before it catches up to South Korea, whose RV Araon icebreaker is depicted here on an Antarctic expedition in February 2012. © Povl Abrahamsen/Flickr.